Appendix injury, microdiscectomy, visceral injury. Lumbar discectomy is the most common operation in the spinal surgery. Although it carries low morbidity and mortality risks, life threatening complications such as vascular and visceral injuries can occur by ventral perforation [1-20]. The anterior portion of the annulus fibrosus is much thicker than the posterior portion. Even though the anterior longitudinal ligament might be expected to act as protective structures against inadvertent penetration by instruments during discectomy, it is obvious that ventral perforation may develop easily, and without the surgeon’s awareness [21-22]. Although the incidence of asymptomatic annulus penetrations is as high as 12 % of lumbar discectomies, symptomatic ventral perforations occur in 1.6-17 per 10000 cases [3,23-25]. Fortunately, the frequency of intestinal injuries is very low and much less common than vascular injuries. In this article, a case of injury to the appendix as a complication of lumbar microdiscectomy is presented and a brief review of the literature on intestinal injuries following lumbar disc surgery is provided. A 30-year-old woman was hospitalized in neurosurgery clinic with a three-month history of pain in her waist and left leg. Neurologic examination revealed that straight leg raising test was positive at 30 degrees in the left leg; left achille reflex was hypoactive and hypoesthesia was observed in the left S1 dermatome. Other physical examination of the patient was normal. On the lumbosacral magnetic resonance imaging a left paracentral disc herniation which was compressing the S1 nerve root was detected at the left L5-S1 level. Left L5 hemilaminectomy, L5-S1 microdiscectomy were performed. The patient was discharged without incident at the following day. On the third postoperative day she was admitted via emergency service with the complaint of pain in her abdomen and waist radiating down to the right leg. Her blood pressure was 90/60 mmHg, pulse 125 /min, temperature 38.5°C. She had an acute abdomen with guarding and rebound tenderness predominantly on the lower quadrants and had a painful lumbar incision. Leukocyte count was 16000 / mm3 and C-reactive protein 98 mg/L. An abdomino-pelvic computed tomography scan showed inflammatory infiltration of the prevertebral space extending to adjacent mesenteric fatty planes at the level of L5-S1 discectomy and a defect of left L5 hemilaminectomy as well (Figure 1). 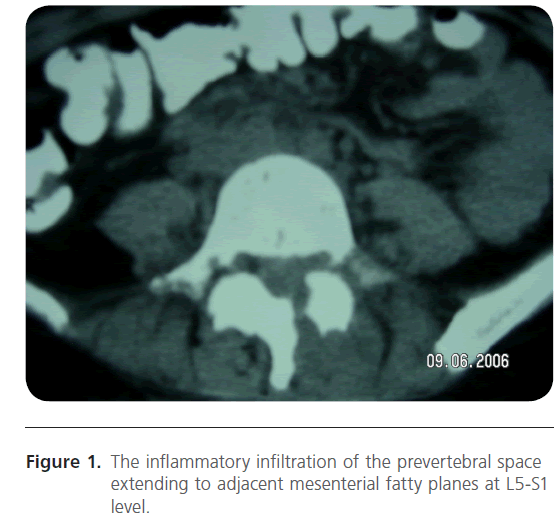 Figure 1: The inflammatory infiltration of the prevertebral space extending to adjacent mesenterial fatty planes at L5-S1 level. While a laparotomy was decided, further exploration revealed a retroceacal appendix nearly 10 cm in length, which was partially transected at midlevel. Although proximal half of the appendix was intact, distal to the transected area, inner layers of appendix were cored out except the serosa (Figure 2). 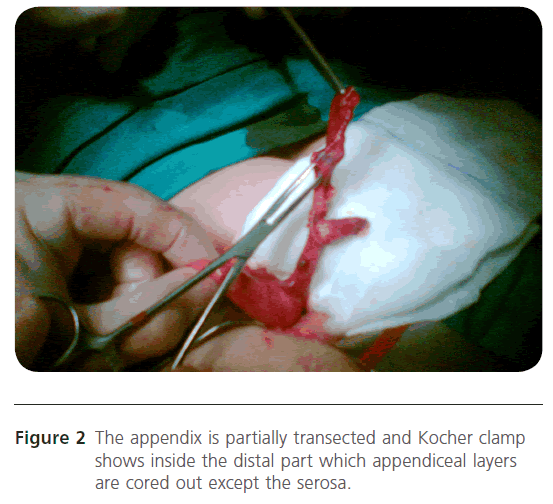 Figure 2: The appendix is partially transected and Kocher clamp shows inside the distal part which appendiceal layers are cored out except the serosa. There was no gross contamination in the vicinity of the appendix and appendectomy was performed. Inspection of the retroperitoneum demonstrated a small hole consistent with the level of L5-S1 disc space. Her postoperative recovery was uneventful apart from lumbar wound infection, which was treated by appropriate intravenous antibiotics for Pseudomonas aeruginosa identified from the wound culture. She was then discharged with no neurological sequel 12 days after appendectomy. She is currently doing well at the third year of follow-up. Intestinal injuries resulting from ventral perforation during discectomy are rare, but may cause dramatic consequences. To date, 22 cases of intestinal injury following lumbar disc surgery have been reported in the literature [1-3,6-10,13-18,20] (Table 1). Sixteen of them occured during conventional discectomies and 6 in microsurgical procedures. However, visceral injuries during transabdominal discectomy were excluded from this review as the mechanism of the damage is mainly retraction injury. 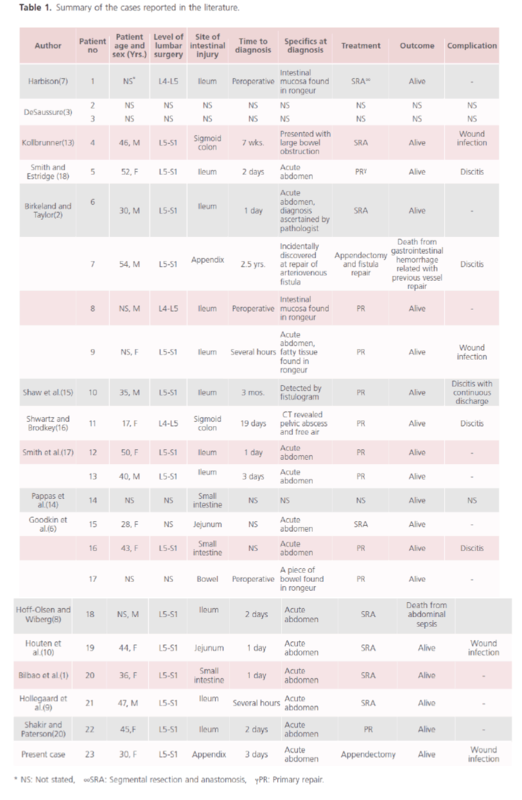 Table 1 Summary of the cases reported in the literature. Intestinal injury was first reported by Harbison  in 1954. Shwartz and Brodkey  later reported the first case of intestinal injury after microdiscectomy. Fourteen cases of these have occured following surgery at the disc level of L5-S1 [1,2,8-10,13,15,17,18,20]. Only three cases have been reported at the L4-L5 interspace [2,7,16]. In five cases there were no details about the level of the injury [3,6,14]. Small intestine is more likely to be injured than the large intestine, since the root of the mesentery of the small intestine arises in front of the vertebral column, extending obliquely from second lumbar vertebra to the right sacroiliac joint . Ileum is the leading site of the injury and accounts for 50 % of all cases. There were two injuries for both of the sigmoid colon and the jejunum and only one in the appendix. Pappas et al. 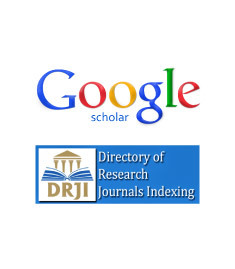 , Goodkin et al. and Bilbao et al. have reported three injuries in the small intestine and one tear in the bowel without further anatomic specifications. Clinical manifestations of such injuries may be extremely variable. Diagnosis is established intraoperatively if the intestinal mucosa is removed together with the disc specimen [2,7]. It should be duely noted that this is most commonly recognised with the signs of acute abdomen within a few days following the surgery, as in our case. So, postoperative abdominal complaints should be carefully evaluated by surgeon in terms of intestinal injury. Abdominal radiograph or tomography may be helpful for the diagnosis. In fact, in one-third of the cases radiological examinations of the abdomen have shown free air in the peritoneal cavity [1,8,9,16,17,20]. Kollbrunner  has reported a peculiar case presented with bowel obstruction. In this case, stenosis of the sigmoid colon has been suggested to develop as a result of local scarring and fibrosis of organization of hematoma from a retroperitoneal bleeding. Occasionally, diagnosis may not be made for several weeks and months due to formation of a mature intraabdominal abscess which gradually develops and induces only mild symptoms at the onset. Shwartz and Brodkey  detected sigmoid colon laceration and abdomino-pelvic abscesses on the 19th day after microdiscectomy. Wound infection with positive culture of intestinal pathogenes can be another manifestation of such injuries . In the case reported by Shaw et al. the patient who had persistent wound discharge for three months after the operation eventually colonised Escherichia coli on culture. A fistulogram showed an unexpected communication between the cutaneous drainage site, through the disc space to the small bowel. In addition, many authors have reported cases of discitis in association with the intestinal injury [2,6,15,16,18]. The unique case regarding the appendix injury due to lumbar disc surgery had been reported by Birkeland and Taylor  in 1970. In this case, injury of the appendix was incidentally found at the laparotomy due to an intra-abdominal arteriovenous fistula 2.5 years after the discectomy. This patient also had a history of the wound infection which required antibiotic therapy of nine months besides two debridements to heal. To our knowledge, the present case is the first report of appendix injury as a complication of lumbar microdiscectomy. We detected the appendix was partially transected nearly at midlevel and was free of mucosal and muscular layers in distal part. A possible explanation of this is that pituitary rongeur grasped the appendix unintentionally during the discectomy and the distal part of the appendix was cored out along with the disc material. The definitive treatment of intestinal injury depends on both the site and the extent of injury together with the period of time between damage and laparotomy. Early diagnosis and treatment may prevent potentially fatal outcomes. Hoff-Olsen and Wiberg  have reported a mortality due to septicemia because of an ileal injury which was treated in only two days postoperatively. The avoidance of the ventral perforation is the most important manevuer in prevention of visceral injuries. The most offensive surgical instrument in this issue is the pituitary rongeur [2,3,11]. Several authors have recommended that the depth of disc space penetration with instruments should be kept to less than 3 cm [2,16,2]. Depth marking of instrument may be useful to prevent the surgeon from inserting it too deep . Moreover, the failure to withdraw the whole volume of irrigant instilled into the disc space should raise the suspicion of ventral perforation and subsequent intestinal injury. Although the pathologic examination of the disc specimen is not routine, it is rational if any doubt is present. In one case of Birkeland and Taylor , diagnosis was ascertained by detecting small piece of tissue identified as bowel wall in the disc material. Another operative strategy is to carry out a limited discectomy rather than a radical discectomy. Birkeland and Taylor  have stated that total discectomy is inadvisable even in the hands of experienced surgeons, and only removal of easily retrievable material from the disc space is required for effective surgical treatment. Other predisposing factors in the occurence of ventral perforation are body habitus, patient positioning, use of magnification, anterior disc ruptures, recurrent disc hernia, previous abdominal surgery, abdominal irradiation therapy, and surgeon’s experience [2,26-29]. However, none of these has been proven as a consistent risk factor [6,17,19]. In addition, preoperative evaluation of the prevertebral structures along with the visceral anatomy is important, which can show pre-existing defects in the anterior annulus and anterior longitudinal ligament [10,30]. In conclusion, a meticulous dissection is fundamental in the prevention of the ventral perforation and subsequent intestinal injury during the discectomy. However, they still may occur without surgeon’s awareness. Intestinal injuries should be born in mind as a possible complication of lumbar disc surgery in patients who present with acute abdominal complaints or prolonged wound infections. Early diagnosis and appropriate treatment may prevent potentially fatal outcomes. Moreover, the patient should be informed of the existence of such complications and written consent is advised. Bilbao G, Menchacatorre I, Uriguen M, Pomposo I, Bardón F. et al. (2004) [Intraabdominal complications in the lumbar disc surgery.] Neurocirugia 15: 279-284. Birkeland IW Jr, Taylor TK. (1970) Bowel injuries coincident to lumbar disk surgery: a report of four cases and a review of the literature. J Trauma 10: 163-168. DeSaussure RL. (1959) Vascular injury coincident to disc surgery. J Neurosurg 16: 222-228. Düz B, Kaplan M, Günay C, Ustünsöz B, Ugurel MS. (2008) Iliocaval arteriovenous fistula following lumbar disc surgery: endovascular treatment with a Stent-graft. Turk Neurosurg 18: 245-248. Gentile V, Musco B, Della Giovampaola C, Lippolis PV. et al. (2007) [Hemorrhagic shock caused by iatrogenic aorto-cava injury. Case report. ] Ann Ital Chir 78: 251-255. Goodkin R, Laska LL. (1998) Vascular and visceral injuries associated with lumbar disc surgery: medicolegal implications. Surg Neuro 19: 358-372. Harbison SP. (1954) Major vascular complications of intervertebral disc surgery. Ann Surg 140: 342-348. Hoff-Olsen P, Wiberg J. (2001) Small bowel perforation as a complication of microsurgical lumbar diskectomy. A case report and brief review of the literature. Am J Forensic Med Pathol 22: 319-331. Hollegaard S, Salomon S, Qvist N. (2009) [Small bowel perforation following microsurgical diskectomy of lumbar disk prolapse.] Ugeskr Laeger 171: 313-314. Houten JK, Frempong-Boadu AK, Arkovitz MS. (2004) Bowel injury as a complication of microdiscectomy: case report and literature review. J Spinal Disord Tech 17: 248-250. Hui YL, Chung PC, Lau WM, Ng YT, Yu CC. (2003) Vascular injury during a lumbar laminectomy. Chang Gung Med J 26: 189-192. Kraemer R, Wild A, Haak H, Herdmann J, Krauspe R. et al. (2003) Classification and management of early complications in open lumbar microdiscectomy. Eur Spine J 12: 239-246. Kollbrunner F. (1959) [Large intestine stenosis after laminectomy.] Gastroenterologia 92: 239-251. Pappas CT, Harrington T, Sonntag VK. (1992) Outcome analysis in 654 surgically treated lumbar disc herniations. Neurosurgery 30: 862-866. Shaw ED, Scarborough JT, Beals RK. (1981) Bowel injury as a complication of lumbar discectomy. A case report and review of the literature. Bone Joint Surg Am 63: 478-480. 16. Shwartz AM, Brodkey JS. (1989) Bowel perforation following microsurgical lumbar discectomy. A case report. Spine 14: 104-106. Smith EB, DeBord JR, Hanigan WC. (1991) Intestinal injury after lumbar discectomy. Surg Gynecol Obstet 173: 22-24. Smith RA, Estridge MN. (1964) Bowel perforation following lumbar-disc surgery. Report of a case with a review of the literature. J Bone Joint Surg Am 46: 826-828. Torun F, Tuna H, Deda H. (2007) Abdominal vascular injury during lumbar disc surgery: report of three cases. Ulus Travma Acil Cerrahi Derg 13: 165-167. Shakir AJ, Paterson HM. (2011) Small bowel perforation--an unusual complication of microdiscectomy: a case report. Acta Chir Belg 111: 36-37. Megele R. (1986) [Anatomic principles of lumbar intervertebral disk operations.] Z Orthop Ihre Grenzgeb 124: 114-118. Birkeland IW, Taylor TK. (1969) Major vascular injuries in lumbar disc surgery. J Bone Joint Surg Br 51: 4-19. Lumbar disc herniation, (2006) In: Greenberg MS, ed. Handbook of Neurosurgery. New York: Thieme p: 302-318. Ramirez LF, Thisted R. (1989) Complications and demographic characteristics of patients undergoing lumbar discectomy in community hospitals. Neurosurgery 25: 226-231. Wildförster U. (1991) [Intraoperative complications in lumbar intervertebral disk operations. Cooperative study of the spinal study group of the German Society of Neurosurgery.] Neurochirurgia 34: 53-56. Bolesta MJ. (1995) Vascular injury during lumbar diskectomy associated with peridiskal fibrosis: case report and literature review. J Spinal Disord 8: 224-227. Palma L, Carangelo B, Muzii VF, Mariottini A, Zalaffi A. et al. (2008) Capitani S. Microsurgery for recurrent lumbar disk herniation at the same level and side: do patients fare worse? Experience with 95 consecutive cases. Surg Neurol 70: 619-621. Porchet F, Bartanusz V, Kleinstueck FS, Lattig F, Jeszenszky D. et. al. (2009) Microdiscectomy compared with standard discectomy: an old problem revisited with new outcome measures within the framework of a spine surgical registry. Eur Spine J 18 Suppl 3: 360-366. Wiese M, Kramer J, Bernsmann K, Ernst Willburger R. (2004) The related outcome and complication rate in primary lumbar microscopic disc surgery depending on the surgeon’s experience: comparative studies. Spine J 4: 555-556. Osti OL, Vernon-Roberts B, Moore R, Fraser RD. (1992) Annular tears and disc degeneration in the lumbar spine. A post-mortem study of 135 discs. J Bone Joint Surg Br 74: 678-682.